There are many natural sights in the world that are a wonder to behold. Among these natural sights are the Niagara Falls, the Victoria Falls, the Amazon, and even the vast Sahara desert. Some of the most beautiful and awe inspiring places in the world are hidden away in the most unexpected places and can inspire comparisons with alien landscapes. One of these places is the Rainbow Mountain Peru which is also known as Vinicunca or Montaña de Siete Colores. Located in the Andes Mountains in Peru, the mountain is one of the most breathtaking sites in the world featuring a colorful mountainside. For anyone wanting to visit Peru, this is one the places that you cannot afford to miss out on! 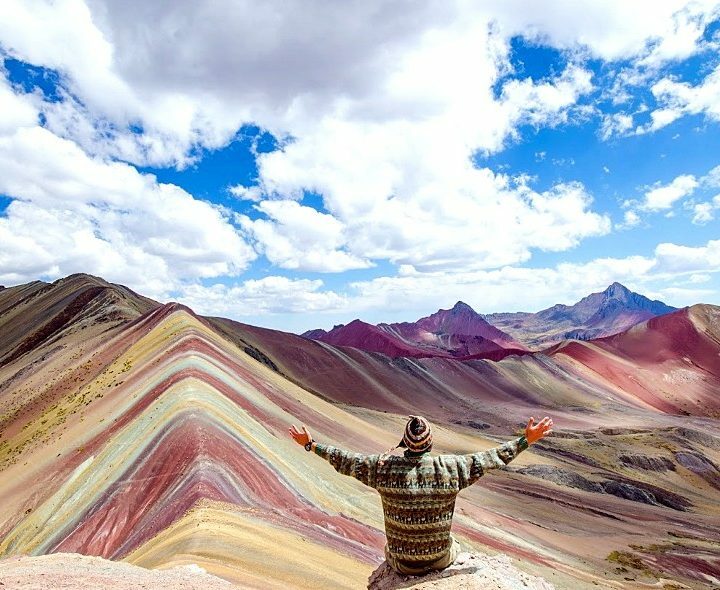 The Rainbow Mountain Peru is completely unique in its wonderful appearance. It is reminiscent of a surrealist painting with its beautiful coloration which includes reds, purples, yellows and greens. The mountain is located in the Andes Mountains by way of Cusco and attract a great number of visitors to the area every year. The distinctive shades of color are exquisite to view and lend credence the name that is given to it as the Mountain of Seven Colors. The mountain has been likened to some of the landscapes used in alien and space inspired films. In fact, many who view images of the Rainbow Mountain Peru cannot believe that it is actually a real place in the world. In Peru, the mountain bears some cultural and religious meaning as most natives consider it a sacred mountain. For artists, tattoo experts and even sculptors everywhere, the beautiful lines of this exceptional mountainside have become inspiration for their works. One of the paintings that almost captures the exact image of the rainbow mountain is the famous work by Edward Munch, The Scream. What makes it so colorful? The distinct appearance of the mountain actually has a scientific explanation despite the fantastic local lore surrounding it. The Andes is a mountain chain that is located on the western edge of South America. The mountain has some geographical characteristics that cause the specific stratigraphic nature of the rainbow mountain. The colors of the mountains come from the composition of rocks and minerals that are present in the mountainside. One of the most vivid colors of the Rainbow Mountain Peru is red. The red coloration is distinct in its layers on the mountainside. The red coloration is as a result of rust due to the iron oxide present in the rocks and has been viewed on other rocks but not on the magnitude of what is visible on the Mountain of Seven Colors. Another color that is prominent on the mountainside is the yellow. This bright vibrant color is as a result of the existence of iron sulphide in the rocks. Similarly, the green color present in the mountainside is likely due to the presence of chlorites in the sedimentary rocks while the purple color is due to oxidized lemonite. The difference in variations and shades of these colors is as a result of the alteration of sedimentary rocks during lithification. The changes in composition are what causes the clear stratified lines on the mountainside. The layered colors of the mountainside are indicative of the many years of natural changes that the mountain has undergone. Altitude of 5,200 meters above sea level. 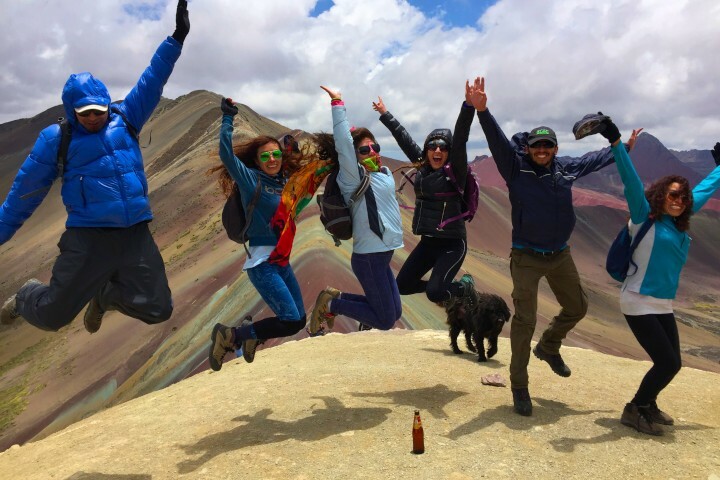 So how can you get to the Rainbow Mountain Peru? The simplest way is to first access Cusco, which is the nearest city to this phenomena. If you are an international tourist then this involves getting yourself a flight to Peru and access the city. Of course, if you are simply a domestic tourist, just find your way to Cusco in the easiest way possible. Once you are in Cusco, research and find yourself a reputable guide who can properly guide you through the steps of accessing the mountain. The reviews of tourists who have been to the Mountain of Seven Colors state that it is recommended to find the best guide possible to ensure that you are properly guided. Unprofessional guides may cause your experience to be much less than anticipated. It is important to know that actually reaching the mountain requires an individual to hike for several hours. Being healthy is a perk of enjoying the hike to the mountain. While some tourists are not impressed by the long hike, it is crucial to know that untouched beauty of this magnitude cannot simply exist in close proximity to human populations. In preparation for the hike, and in consideration of the fact that the mountain is several thousand feet above sea level, it is important to have the correct gear for mountain hiking. This can include hiking boots, warm clothes, head gear and safety gear. As an individual who has visited the Mountain of Seven Colors or Montaña de Siete Colores, I want to assure anyone considering visiting this place that it is completely worth the view! The beauty of the mountainside will inspire you and excite your senses. I recommend the trip for anyone who is artistically inclined and who is attracted to isolated and beautiful landscapes. Visit Rainbow Mountain Peru wiki and enjoy this view in person.